The horror... The horror! No really, that's quite a lot of horror. 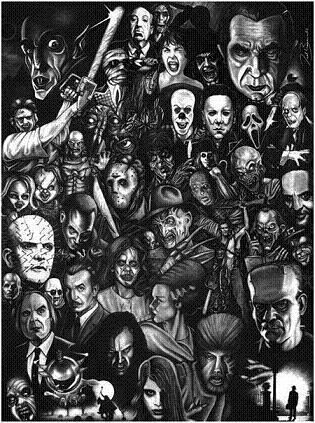 "The Cinema was made for Horror Movies. No other kind of film offers that same mysterious anticipation as you head into a dark auditorium. No other make such powerful use of sound and image. The Cinema is where we come to share a collective dream. And Horror Films are the most dream-like of all, perhaps because they engage with our nightmares." Live-action films that belong to the Horror genre. For tropes commonly used in these films, see Horror Tropes. See also Slasher Movie, Zombie Stories, Werewolf Works, Ghost Fiction, Vampire Fiction, Witch Works, Sci-Fi Horror, Horror Comedy and Folk Horror. Ghoulies III: Ghoulies Go to College! I'll Kill You... I'll Bury You... I'll Spit on Your Grave Too!